Hey there seems like you just created a Blog on the Blogger or wordpress platform then I guess you should get a domain name for your blog. I know you’d be like ‘Do I really need a domain name?’ oh yes you do mate! I’ll just give you some Basic reasons why you need a Domain name for your Blog! 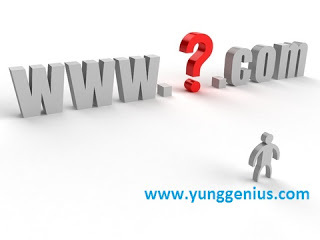 Getting a domain name for your blog gives it an identity, the initially sub-domain for this Blog is www.getinformed4real.blogspot.com but after some time I decided to give my blog an identity so I decided to get a domain for it which is Yunggenius.com. Did you know that most advertising companies accept/respond to Blogs faster with a custom Domain?? Now you do, so for a better chance to get Approved by some advertising companies it will be a wise to get a Domain name. Most popular Blog or Forums are only popular these days simply because they have a domain name. So all I am saying is that getting a domain name for your Blog give it more light. Getting a domain name is much more than the reasons stated above it goes beyond that. But I hope after you’ve read these tips you might consider getting a Top-Level Domain for your Blog!